our good work. 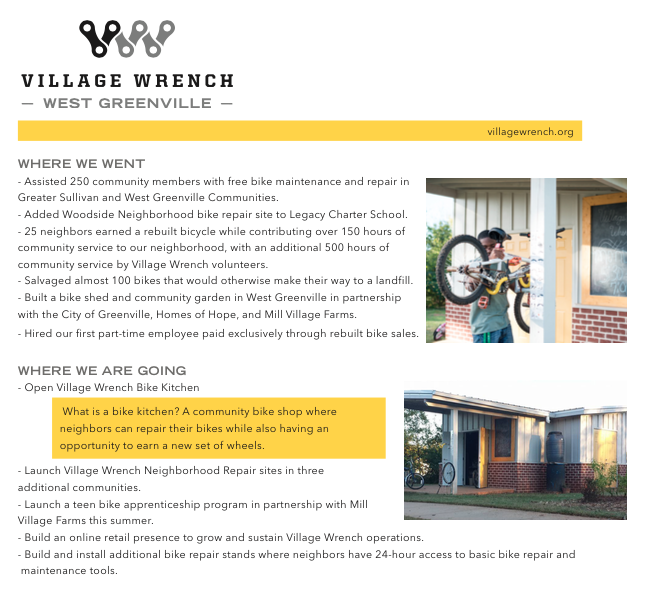 However, I know many of you may still be confused on how Mill Community Ministries, Mill Village Farms, Village Wrench, and Nasha Lending all fit together. So, let me begin with sharing what binds each of us together underneath Mill Community Ministries; we are a team of social entrepreneurs united together with a mission to join God’s vision for individual life change and holistic transformation within our communities. However, our values at Mill Community Ministries are truly what keep us together. We value reconciliation, working to restore our relationships with God, our self, each other, and the environment. We value dignity, working to treat everyone with respect and value as people made in the image of God. We value empowerment, working to unleash people’s talents while never doing for others what they can do for themselves. We value neighboring, working to dig deep roots in our community by living locally and raising our kids in the neighborhood. One of the highlights from 2015 is the impact and growth of our youth at Mill Village Farms. I think of DeAsia, who joined us as a quiet and timid high schooler, but has grown and flourished with us at Mill Village and has become one of our biggest advocates in the community. Collectively, our crew of 30 teens grew over one ton of produce that served over 4,000 customers in our revamped Mobile Market that traveled to 12 different locations each week from June to October. All the while, our teens learned invaluable skills in sustainable agriculture, entrepreneurship, and customer service, and more importantly grew their confidence, responsibility, and work ethic. The good work behind and ahead of us could not be possible without the generous support of our donors, volunteers, and staff. I pray you will continue to support our work with your time and resources as we push onward in 2016.